Depression is highly prevalent in college students with a lack of access to care on college campuses. This study utilized a novel recruitment strategy and examined the efficacy of CBT provided by specialists in a depression clinical research center. We conducted depression screenings at four universities in the Boston area. 30 college students (ages 18–24 between 2009 and 2013) who were experiencing symptoms of depression and/or suicidal ideation were offered 12-weeks of a flexible manualized form of CBT. 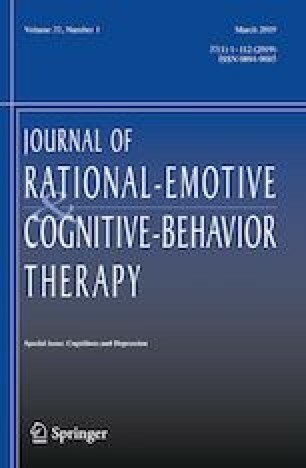 CBT resulted in a significant reduction in depression, anxiety, suicidality, and some forms of negative cognition. CBT was effective for reducing depression and related symptoms, including suicidality. Larger-scale, controlled trials, utilizing novel recruitment strategies joining academic medical centers with college campuses in desperate need of services, are needed to confirm whether this treatment and methodology would be feasible and effective for this vulnerable population. We would like to acknowledge the Jed Foundation and the Chirag Foundation for their support for this study. Weissman, A. N., & Beck, A. T. (1978). Development and validation of the Dysfunctional Attitude Scale: A preliminary investigation. Retrieved from https://eric.ed.gov/?id=ED167619.